Most who watch big sporting events like Soccer’s World Cup, the Olympics or March Madness are only concerned about who is going to win. Then there are the rest of us who wonder how many petabytes of video, Facebook comments, legal/illegal YouTube mashups and tweets they’re adding to Big Data. Today, folks are streaming more content from a whole lot of sources to many different devices … because we can! And it’s spawning some new projections on how we view our content. 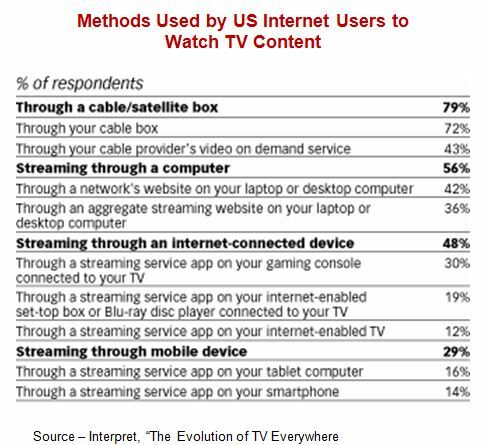 You know, pay-TV folks are on their last leg, OTT (over-the-top) people are taking over, tablets are replacing TV sets and smartphones/phablets are doing ‘em all in. With all of these new sources, the market analysts are reporting that TV sales are flat. The only reason you have a TV is so you can run home at night to catch up on the action you saved with your DVR (digital video recorder). Most of the speakers at OTTCON (Over-The-Top TV Conference) were pointing out that what we really want are more choices than the ones the cable and satellite guys are giving us. That’s sorta’ true, which is why we like our little Roku dongle (yeah, they’ll have an app for that) and the reason people are so excited about Samsung’s Evolution Kit, which makes yesterday’s sets smart. The truth is there are 100 million pay-TV households in the U.S., so people are just moving back and forth. Funnels – People use a wide range of options to watch their online content, and most of the time it doesn’t involve cutting the cord – yet. The challenge for PayTV folks is to attract/entice the age groups that were born connected to the Internet where everything was available, everything was free. There are a growing number of cord-cutters (viewers who cancel their cable, satellite or telco video service), especially outside the U.S. We simply aren’t adding households, so they’re dealing with a finite market, a market that is getting older. 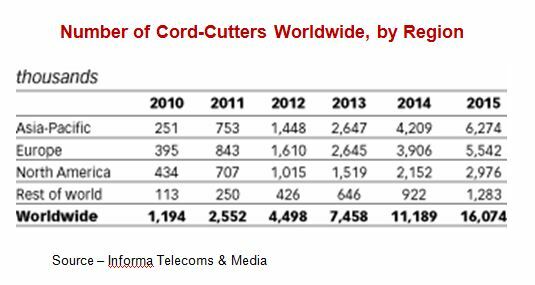 Cutting The Cord – Dispensing with cable or satellite paid service bundles is more prevalent in the Asia-Pacific and Europe than in the U.S. Of course, they also have faster, better and less expensive Internet service, which helps. The entertainment world has changed – dramatically – since everyone huddled around the little black and white screen with their TV dinner to watch The Lone Ranger, The Sid Ceasar Show, Ed Sullivan. Today, kids (and the rest of us) have choices. They’ve never known life without the Internet and a world overflowing with content and on-the-go viewing options. 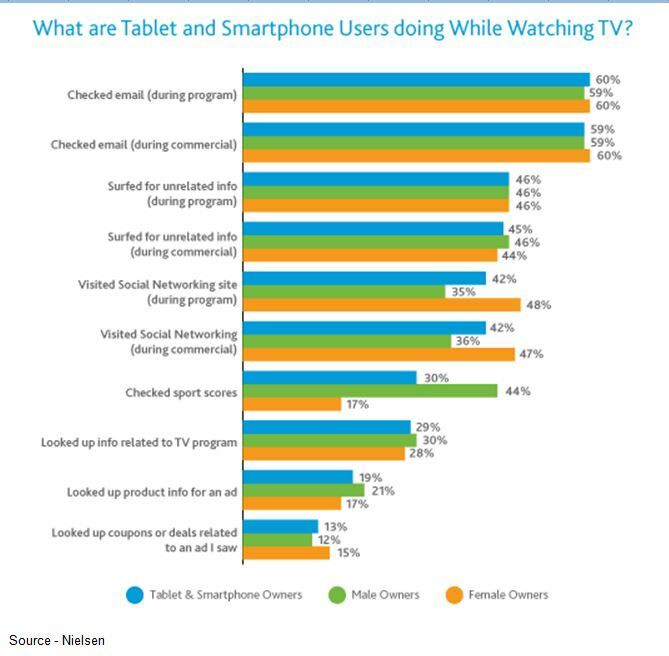 Screen of Choice – Even though the living room and TV set are the first choice for their entertainment (about 50 percent of the respondents), people are increasingly wanting to enjoy their content on their device – TV, computer, tablet, phablet, smartphone. Repurposing and having content available is a lot of work. You have to admit that tapping online content is really neat because there’s so much good stuff (along with some really bad/dumb stuff) out there. Online Viewing – Once you stray from the pre-packaged content provided by the pay-as-you-go entertainment industry, the options available to consumers are seemingly endless. The challenge is finding the content you want without a lot of effort. Right now, that means using specific apps for specific content sources. Of course, our kids have to point us to it because there’s just too much and its spread all around the globe in every nook and cranny. To give you an idea of just how popular online content has become, YouTube reported they now have more than one billion visitors every month to watch the constantly uploaded, cute cat videos. One billion visitors a month is equivalent to about ten Super Bowl audiences or the third largest country behind China and India. So it’s not just the new shows, new events and news. Do a little nosing around the iNet and you can find some fantastic treasures and obscure videos that will really interest you. 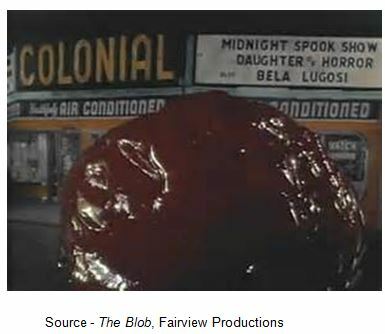 It’s Out There – One of the best things about the Internet content repositories is that with a little work you can find stuff that’s extremely interesting to you even if it doesn’t have mass audience appeal. The challenge for the suppliers is monetizing it and making it somewhat profitable. When you stumble on the stuff but don’t have time – right now – to watch it you can store it on your device for later. Motorola recently stated in their worldwide media engagement report that nearly 40 percent of the content we store is never watched. It just sits there in the dark waiting for someone – anyone – to show it a little love and attention. No, you’re not contributing to some landfill; but you are making IDC’s storage projection of 40 zettabytes by 2020 look darn good. The way we’re going, it’s probably a low number and I can’t even remember how big a zettabyte is … but it’s big! Worldwide, we average 25 hours of video content a week. The living room is still the focal point (it’s a nice place to be with the kids) but we’re also mutiscreening with laptops, tablets and smartphones. Social TV – A lot of experts are telling us that we’ve entered the period of social TV where we not only watch a show but we actively interact with it. That’s true to an extent, but that is still in its infancy. It turns out people like to do other things while resting their brains. The great thing about smart TVs and the iNet is we can use our devices for all of the things we want to do while being entertained. Well, there are a couple problems along the way right now. Finding the content you want online is still a challenge. Sure you can sign up for NetFlix, or buy Samsung’s solution or use Fredio’s online solution or scrounge around YouTube and hope you stumble on it. Everyone has an app for that … their app! What we really want is the ability to find content quickly and then automatically load it on the set/device we have with us at the time. It’s a Right – Well, perhaps getting the content you want, when you want it, how you want it and where you want it isn’t a right but it is what people increasingly expect. We no longer want to be tied to/limited to one device for news, information, entertainment. 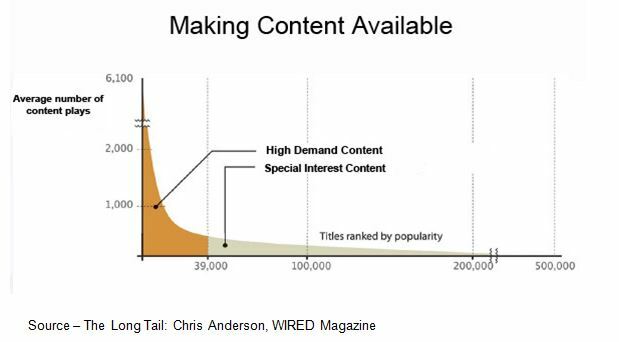 It isn’t so much that people want to shove it to the cable, telephone or satellite companies, it’s just that folks want content and they want it when, where and how they want it. As Deloitte put it … we’re digital omnivores! We have all of these media-capable devices and OMG, we want to use them – smart TV, gaming console, iNet dongles, laptop computers, tablets, smartphones. And folks keep creating and shoving more stuff for us to consume. In addition to TV shows/movies, we have games and breathtaking series (have you seen Warner Bros. Mortal Kombat?). Kids are scripting/producing/posting their own shows (and becoming mini-stars) and sporting events are scrambling for their share of the eyeballs/revenue. Content is getting bigger and better; and frankly, I simply don’t know what all those apps on my TV set, iPad, smartphone lead to … it can’t be good. It just keeps getting bigger and bigger.